Washed with the blood from your beheading Kodratos. Which is unbearable without dying, making known God's grace. And Cyprian hastened to die with him. 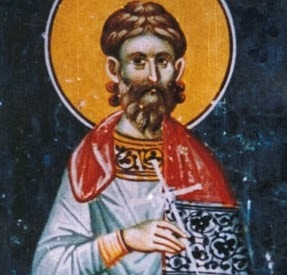 On the tenth Kodratos was killed by the sword. 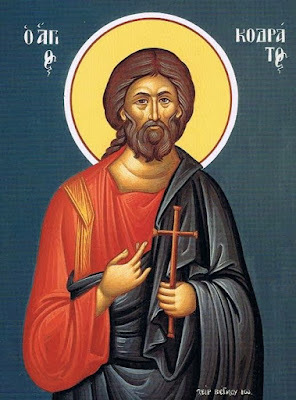 The Holy Martyrs Kodratos, Anektos, Paul, Dionysios, Cyprian and Crescens were friends who were martyred during the persecution of either Emperor Decius (249-251) or Emperor Valerian (253-260) in Corinth, when the governor of the region was Jason. During an earlier time of persecution of Christians, many of the faithful fled to the mountains and into the caves. So did the mother of Kodratos flee Corinth. She was pregnant at the time and gave birth to Kodratos in the forest and died shortly thereafter. Thus Kodratos grew up in nature and in solitude. He who sent manna from heaven to the Israelites in the wilderness, dropped from the clouds a sweet dew on the mouth of the child Kodratos to feed him. When he was twelve years old, he entered into town and there some benevolent men took a liking to him and provided him with an education. He studied medicine and healed the sick, as much with natural cures and even more by the power of the Holy Spirit and prayer, which he was accustomed to since his childhood. When a new persecution arose again, Kodratos was brought to trial and cast into prison. He was joined by five men to whom he had been teaching the Christian faith: Anektos, Paul, Dionysios, Cyprian and Crescens. They were all dragged through the streets by the pagans, especially by their children. They were beaten with rods and stoned until they were eventually dragged to the scaffold. There, the Martyrs prayed to God and were beheaded. On this spot a source of water gushed out of the ground which is still called "Kodratos" even today and is a reminder of the heroic deaths of these six holy innocents for Christ. A church was built there and their holy relics were venerated therein. Let godly-minded Kodratos, Anektos, Paul, Dionysios, Cyprian and Crescens be praised with tuneful hymns; for as the sixfold choir of Christ's prizewinners, they ever pray for us to the Trinity. When you contested bravely in Corinth, O wise Martyrs, you appeared as lamps of six lights; you ever illumine the way for Christ's faithful by the grace that was given to you.